If there’s one word to describe Joe Carrero, it’s POSITIVE. Joe Carrero believes in himself! He believed in his ability to succeed in bodybuilding in 1978 when he joined my Staten Island Bodybuilding Club, and he still believes today with his strong will and positive attitude on life. I first met Joe in August of 1978, when he joined my gym and expressed a desire to be a competitive bodybuilder. At the time Joe was just 14 but showed tremendous genetic potential for his chosen sport. Having previously trained home with a 110 lb. barbell set his parents bought for him when he was 13, Joe already had the ‘‘iron bug’’ deep in his heart and was ready to take on all challenges. After evaluating Joe, I put him on a six days a week training schedule and monitored his progress through the coming weeks. Within a few months Joe was full squatting 260 lbs., leg pressing 520 lbs., and benching 210 lbs. for 3 sets of 10 repetitions. It was amazing to watch him train for he was becoming stronger with each workout, which further motivated him to pursue a competitive goal. In October of that same year, Joe asked me about the possibility of his competing in Dan Lurie’s upcoming W.B.B.G. Mr. Staten Island Bodybuilding Competition which was scheduled for May of 1979. Seeing Joe’s competitive spirit I thought it would be a good idea for the kid to get some experience on the posing dais, not realizing what a big impact he would soon make at the show. By February, Joe’s bodyweight was a solid 175lbs. and was ready to be molded and refined for the upcoming competition. He was now 15 and was training relentlessly while following a nutritional program I designed specifically for him. On the day of the show Joe weighed in at a muscular and symmetrically polished 150lbs., looking far superior to competitors who out weighed him by 40-50 lbs. His physique’s balance and poise awed the savvy New York crowd, and more importantly the judges who awarded Joe 2nd place to a seasoned Lou DeBella whose time had come to take the crown. Also on this night were 78 other competitors who competed in Dan Lurie’s W.B.B.G. Mr. New York City Show, which included the city’s five boroughs. Joe would out score many of the competitors and go on to take top honors by winning trophies for Best Back, Abs, and Posing. Remember Joe Carrero was just 15 years old! To say Joe’s ego grew from this experience would be an understatement. He was ready to take on the World and wasted no time getting back to the gym and pumping out the iron. His competitive career would span 14 years across a nation of physique artist, one of which would go onto become a multi I.F.B.B. Mr. Olympia winner. In 1991, Joe trained extremely heavy and bulked up to a massive 238lbs. during the off season, dieting down to a ripped 214lbs. on a 5’6 1/2’’ frame to compete in the heavyweight class of the N.P.C. Mr. USA . At the time, Joe was 27 years old and was told by the judges that he was to big for his height, which in today’s android world would be unheard of. An interesting point to this is that Joe placed higher than most competitor’s that day, one in particular, who would go on to be the most massive and recognized bodybuilder in the World during his reign. I’m speaking about one Ronnie Coleman, a future I.F.B.B. Mr. Olympia, who on this day was bested by Staten Island bodybuilding legend Joe Carrero. Some of the other well known bodybuilders Carrero has competed against include Rich Gaspari (N.P.C. 1982 Teen American Championships) and Ken “Flex” Wheeler (N.P.C. 1989 California State Championships) who both narrowly beat Joe for the overall mentioned titles. In 1990, this writer nearly had a stroke while watching the California State Championships on a national T.V. broadcast, where Joe Carrero placed first in the Light-Heavyweight Class and Chris Cormier placed first in the Heavyweight Class. It was as clear as Schwarzenegger’s right bicep that Joe was the better man on this day, possessing a fuller, more muscular and symmetrical physique as compared to Cormier’s, and yet the powers that be gave Chris Cormier the nod creating one of the most controversial decisions in the history of the sport. After this controversial placing, Joe was photographed by ace lens men Art Zeller and Ralph DaHaan at various gyms and locations in Los Angeles and San Diego . The photos would soon find their way into many physique publications including Flex Magazine and the UK ’s Body Power Magazine, giving Carrero the international spotlight he so richly deserved. 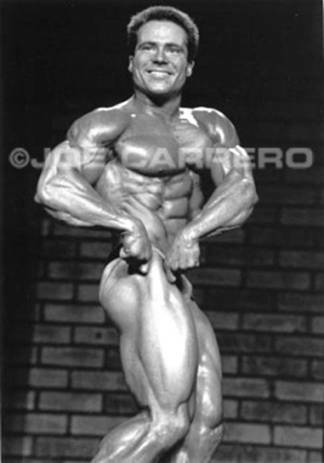 In the years to follow, Joe Carrero’s fortitude would branch out into different arenas of the bodybuilding spectrum. Besides becoming a well known national physique champion in the 1980-90’s, Joe would go on to design individual weight training programs for corporate America while also serving as guest speaker for enthusiastic crowds everywhere. His brother John, also a competitive bodybuilder, would carry on in the family tradition by promoting natural physique and Fitness America competitions annually in Folsom, California . In 1996, during the Staten Island Bodybuilding Championships, N.P.C. bodybuilding promoter Mark Delio presented Joe Carrero with the Staten Island Bodybuilding Award, for excellence in a career that inspired many home town muscle builders to train harder and believe that they too could accomplish their dreams with the same fortitude and positive attitude that Joe transpired. After the show, a special dinner was given in Joe’s honor with Staten Island legends Leon Brown, Charlie Williams, and Mario Strong in attendance, to name a few. Today, Joe Carrero continues to train with the same hunger that brought him to the national stage during his competitive career. He has made a successful living in the posh environment of Silicon Valley, California ; bringing the same discipline and determination that has earned him so many titles and awards in bodybuilding into his chosen financial career. Although Carrero doesn’t compete anymore on the physique stage, he continues to spread the good will about muscle building. Recently he has ventured into the cyber arena with his ever popular Web site JoeCarrero.com (see links page), which will undoubtedly become a success like all of his other pursuits. With his Fortitude Creates Champions attitude, Joe Carrero is a shining example of one who marches forward, refusing to succumb to any misfortune, as he knows deep within himself, that he is a CHAMPION. You know, I've been involved in Bodybuilding many years. I've done all the training, tried all the systems, read all the literature I could on the subject. I've been to contests, seen movies and met just about every famous Bodybuilder who ever lived. What I am trying to say is that with all my years in the sport, with all my knowledge and experience in training people, I have never seen anyone with as much potential as I've seen in Joe Carrero. This kid has the symmetry and lines of Frank Zane, while holding the potential to build the mass of Danny Padilla. All he needs is time! I first heard about Joe in July of 1978. A member of my gym, The Mario Strong Staten Island Bodybuilding Club, said that he had a friend who was only 14 years old. He kept telling me how well built and strong his friend Joe was. From some of the things he was telling me I was beginning to think he was crazy. Finally one day Joe joined the gym. Well, I took a good look at Joe and realized that he had an unusual potential. Joe always expressed a positive outlook on life. He had that look of confidence that one day he would be on top. Time would tell. Joe started training in August of 1978 at the gym. He worked out six days per week. It was the first time that he trained with a variety of equipment. Until then he had only used a Barbell and Bench set that his parents had bought for him. While other members were making good gains, it was nothing compared to Joes. The kid actually became stronger day by day. It was amazing, the other members of my gym wanted to know his secrets. If there was any secret for his tremendous gains it was his positive attitude. He believed in himself. He was only 14 and working out with 260 pounds in full squats, leg pressing 520 pounds and bench pressing 210 pounds for 3 sets of 8 - 10 reps. It was October, 1978 and the WBBG Mr. Staten Island contest was approaching in May. About a dozen or so members in the gym started training hard for the show. The competitive spirit was in gym and it was suggested that Joe go in the show just to get the experience. Joe asked me about this and I said it would be a good idea that if he planned to go far in Bodybuilding competition he should get all the experience he could. Joe's training intensity picked up at an incredible rate. He went from a bodyweight of 155 pounds to 175 pounds in just five months. It was now February, 1979. Joe was 15 and training like a Professional Bodybuilder with 10 years experience. In whatever exercise he did you could see that he felt it within. He trained for a deep pure pump in every muscle group. Three weeks before the contest I checked his leg development and was disappointed. They had shape but lacked in size and cuts. I put him on a special program, emphasizing Front Squats and Heavy Leg Curls. The results speak for themselves. By contest time his legs were greatly improved; enough to get him several votes for the Best Legs award. On the day of the contest the audience was amazed to say the least. Joe weighed a cut - up 150 pounds. Whether he stood relaxed or posed, he looked superior to most of the other competitors who outweighed him by 40-50 pounds. I will never forget the audience's reaction to his Vacuum Pose. He actually pulls his Abdominals behind his Chest. It's got to be the best in the world. I have never seen any better. At the end of the Mr. Staten Island contest, Lou DeBella was the Overall Winner. He had good size and proportions, taking the Best Arms award in the Mr. New York City. Joe placed second which was very good considering he beat out Bill Cirelli who placed third and is a well known Bodybuilder on the Island. Joe's night was just beginning. In the Mr. New York City contest he won Best Back, Best Abdominals and Best Poser awards which is a great accomplishment going against 78 other contestants competing for the same titles. Remember, Joe is only 15! The future looks bright for Joe. He has all the ingredients to become a Champion. With his positive attitude and confidence in himself he can become the best in the world. It's only a matter of time!